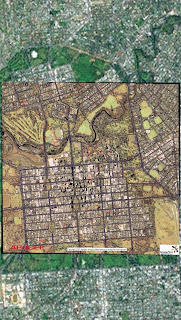 Australian company Apogee has produced a new kml which shows their new product based on EROS-B imagery. IKONOS is 1m Pan – 4m Multi.- Scene size 10km X strip length limited by onboard recorder and ground station EROS-B is .7m Pan – Scene size 7km X strip size with similar limitations. The other sensor with similar capabilities to IKONOS is Orbview-3 but it has recently failed. QUICKBIRD-2, is in league with EROS-B 0.65m Pan and Simultaneous Multi. Here is the kml (unzip it first) which can be loaded in either World Wind or Google Earth.